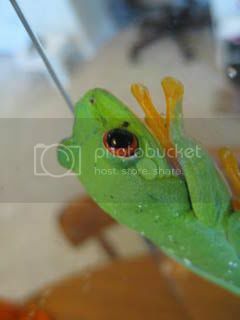 Paw Talk - Pet Forums > Other Pets > Reptile & Amphibian Discussion > -Photos- Check out my new Red Eyed Tree Frogs! 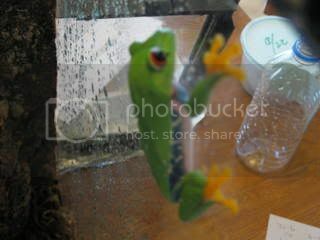 Check out my new Red Eyed Tree Frogs! Look what I added to my zoo! Two beautiful Red Eye Tree Frogs. Enjoy the pictures. They are the best that I could get at the moment. My froggies's close-up! He is wet, just got misted! Check out those awesome tootsies! hee hee. Oh, I am just so in love with them already! Check out the blue on his sides! It goes all down his/her legs when it is stretched out. Too awesome. And those eyes when they are open are soooo cool. They are so vibrant, that they almost glow red. His whole body is done in such vibrant colors that he just glows colors! Hope you enjoy the pictures. I will try to get some better ones. The terrarium that I got is awesome too. It opens not only from the top, but from the FRONT too. Should be able to get some pretty good pictures once they get used to their new home. Ooo they are so cool! This really makes me want some. Are they easy and inexpensive to care for? they are beautiful!! where did you get them? were they expensive? 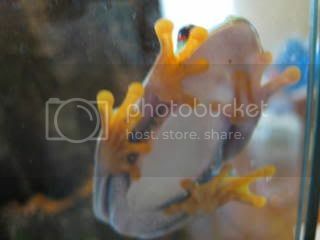 Your going to have to post some new pictures of your other froggies too - all you other threads with them have no more pictures. They are gorgeous lil fellas! Wow, adorable little guys! They are too cute, thanks for the pics! Charlene are they hard to look after? also what do they eat. I love those li'l guys. They are really easy keepers, but you have to mist them a couple of times a day, which is no problem. They love it misty in their cage. They just eat crickets, about 12 each a week, which isn't that expensive, crickets here are about a dollar a dozen. They cost $49.99 each. And their cage was about $130.00 all made up. I will try to post a picture of the cage later. It was a bit expensive on the initial set up, but I was crazy that day. They can be housed alone, and initially I walked out of the petstore with just one, only to be driving back an hour and a half later for his little friend! LOL. I think everyone should have a friend. I thought my husband would have had a cow, but he really likes them! He has welcomed them into the house. No problem! And, I didn't know my other posts' pictures had been deleted. . . go figure, Photobucket is funny sometimes. I will get some photos up soon. 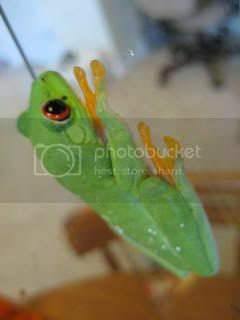 Anyway, during the day, these little guys curl up into little balls and you wouldn't even know that they are froggies! I will get a picture of that too and post it soon. It is awesome. And they don't move much. 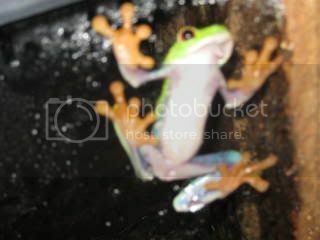 So if you are looking for an active frog, they are not the frog for you. They do their hunting and moving around at night. But, they are really cool. I'm still waiting for mine to "get used to their new home" and I think that they will move around alot more. 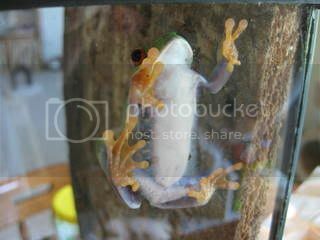 Most of my other frogs usually took a couple of months before they would actively move around in their new homes and let me actually "see" them! LOL. I love how vibrantly colored they are- they look kida like the little plastic toys!